"So here's the plan: Be sure to get to bed early tonight because we'll begin operations at 0300. Arrive at destination at 0400. Our chart has already been mapped out and the target items identified. This will be an in and out operation. No side tracking. No extra stops. We want to make this as fast and painless as possible, got that?" "Right," replied Janelle. "I'll put some muffins in my purse now so we'll have something to eat." "Excellent. All right, see you in the morning," I replied. I hung up the phone. Operation: Black Friday was go. For the most part I avoided this unofficial holiday; a holiday when humanity abandoned all concepts of fair play, cordiality, and pleasantness and became worshippers to the cult of consumerism (at a new, unheard of low price!). I usually started my Christmas shopping somewhere in September, but that doesn't mean I wasn't picking things up all year round. If I saw something in a store that just seemed absolutely perfect for someone I would just get it then and there. Once home I would hide it in my closet and stick a little label on it in case I forgot who it was for. By December 1st, my shopping was usually complete. However, only days ago, I had read in a newspaper ad that black pashmina scarves were going to be on sale in one of the department stores at the mall. It was something I knew my mom had been wanting for a few years now but had never seemed to find one that was high quality and affordable. The scarves advertised were Hermes. Black Friday sale price: $100. Completely and totally unheard of. It seemed that I would have to brave Black Friday. I had heard the tales of Black Friday. The insanity and carnage. People abandoning all appearance of civility in order to get what they wanted. If these people were crazy enough to camp in front of a Best Buy all night, then it was doubtful they would have any compunctions about shiving you in the kidney for the last flat-screen television at %75 off the sticker price. People got trampled to death at Black Friday. Think about that. People died in the pursuit of Christmas shopping. That's messed up. I knew that to brave the war zone alone would be foolish, so I called my best friend Janelle and asked for her to assist me. Fortunately for me the GameStop was having a sale on a new video game and the company that made it had expressed last week that their production wasn't going to meet demand that holiday season. She knew that there would have to be blood over this and she was damn sure it wouldn't be hers. She was in. It was 40 degrees outside and still dark when we arrived at the mall at exactly four in the morning. Surprisingly, the lot wasn't as filled as we had expected it to be. Given, it was 1997, and the Black Friday mania hadn't quite taken the hold it has today. In fact, this was the first year that the mall had advertised that many of its stores would be opening this early. Regardless, Janelle and I steeled ourselves for the fight. The plan was simple: get inside to the first floor of Nordstrom and split up to look for the scarves. Once one of us found them we would grab one and call the other via cell phone. The other would meet up with the finder so we could affirm that the target had been acquired. 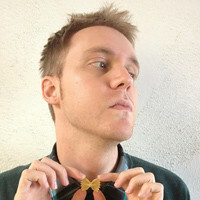 Afterwards, we would eat our muffins as we moved through the throngs of people to get to GameStop for the video game. Once all missions were accomplished, hopefully by 0500, we would leisurely go for Breakfast at Denny's for a plate of Moons Over My Hammy. We arrived a minute or two after the doors had open. Again, this wasn't the Black Friday craze we're used to seeing on the news where people are literally trampled to death. However, the crowds were thick and moving through them was tedious, it reminded me of leaving a sports stadium or concert theater after a huge event. You can't really move on your own but, rather, you pulsate and meander in a specific direction as one part of the crowd. You're no longer an organism of your own, but a cell of a bigger one. Janelle went off one way and I another. I did my best to cut my way out of the crowded department store pathways and weave through the racks where there were fewer people. Before I could go far I could hear Janelle calling me. She had found the scarves far faster than I had expected either of us to do so. I found my way towards her, dodging old ladies and irritant tweens, and past a pile of Calvin Klein denim to a stack of black Hermes scarves. "Sweet! That was easier than I anticipated!" I picked one up and looked at my prize. Suddenly another hand grabbed at it, "I need that!" I looked up and saw a prim woman in a knit hat, shawl, and obviously pricey winter wear that I assumed she picked up not from any high-end department store but from the shops of the actual designers. Her face was a little worn and was done up as well as anyone can put on makeup to cover the fact that they woke up at three in the morning. "He was already holding it," huffed Janelle in my defense. "I saw it first. It's mine," the woman demanded. "Okay, lady, no. I already had it in my hand. Also, if you look down for a moment you'll see there are still plenty left on the table," I replied. I did my best to give her my I-will-punch-you-in-the-throat stare, but at eighteen I still hadn't perfected it yet. Still, she backed off and looked down at the table where a messy pile of black cloth was quickly reducing under a tangle of fast hands. She turned, grabbed one, and left without apologizing. She had been caught up in the Black Friday zeal and was now under the sway of greed and consumerism. I was always under the impression that it would take war or a zombie apocalypse for people to start acting like crazed lunatics. Turns out that Christmas shopping can do it too. Wasn't this supposed to be a season of good will and cheer? I made my purchase. Janelle and I whisked ourselves off to the game store where we nabbed the last copy of the game. (This, incidentally, caused the teenager behind us to actually throw a fit at the department store clerk who had helped us.) As we made our way out of the store Janelle whipped out the muffins from her purse. They possessed the dull, one-dimensional, cold taste of muffins bought from a big box store. Still, they were fuel. We looked into each store as we passed by and watched as people frantically grabbed and clawed at, well, everything. We even witnessed a verbal fight break out as we passed a shoe store. We laughed and pointed, and made snide comments. We critiqued how the world had fallen into such disarray in the way that teenagers who think they know better than everyone else in world often do. Of course, we realized we weren't much better. We had gotten here earlier than most of the people in the mall. What did that say? These days I do most of my shopping the same as before. I purchase items throughout the year that I think would be perfect for others. I make jams and jellies as gifts. I'm probably Amazon's best customer. I refuse to go into the mall come between late-November and all of December. It's insane to do otherwise. I'd rather point and click at home. The muffins I make for these arduous online shopping runs are much better as well. Nothing mass produced or uninspired. They're simply tasty morning muffins. 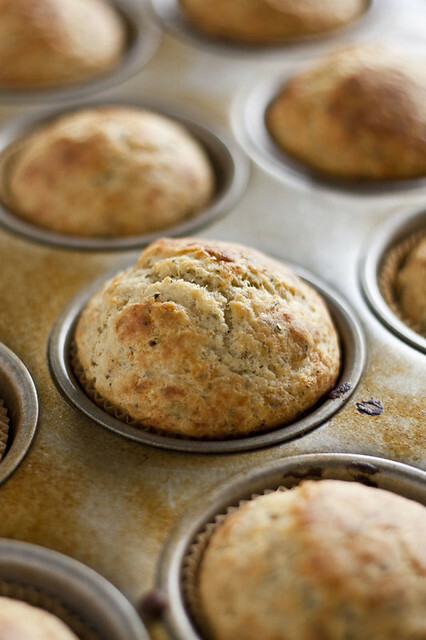 Filled with herbs and grated Parmesan they're bright and nutty. 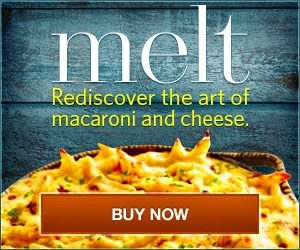 The cheese melts on the top and forms a delightfully, slightly crunchy crust. 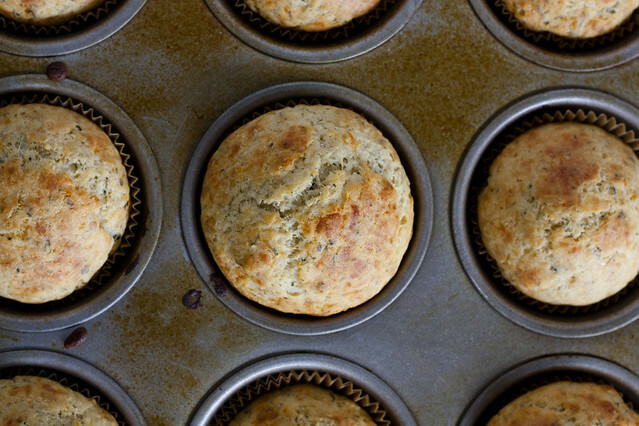 Smeared with butter these perky muffins are an appropriate shopping food be you braving the stores or shopping from the couch. This year, as I watched the news reports of more injuries people incurred from rushing stores as they opened the doors, I ate my muffins in peace. I looked down at my computer screen and clicked "Proceed with my purchase." "Well, that's done." I muttered to myself, ripping off another piece of basil scented bread and popping it into my mouth. "I should really send Janelle this recipe..."
I've used both dried and fresh herbs for this recipe. 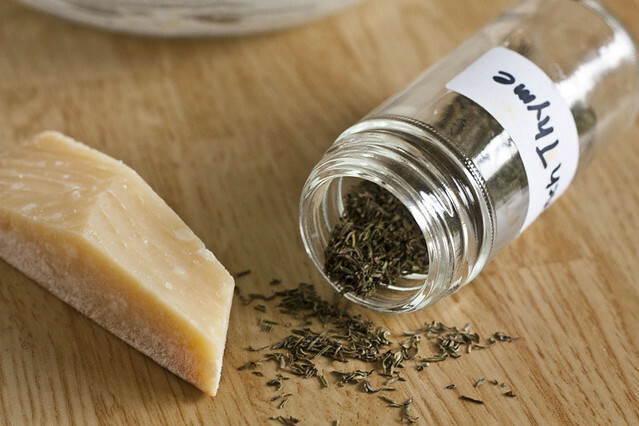 If you use fresh then use maybe 1/2 teaspoon more of the herbs. 1. Preheat the oven to 400F. Line a muffin tray with paper cups. 2. 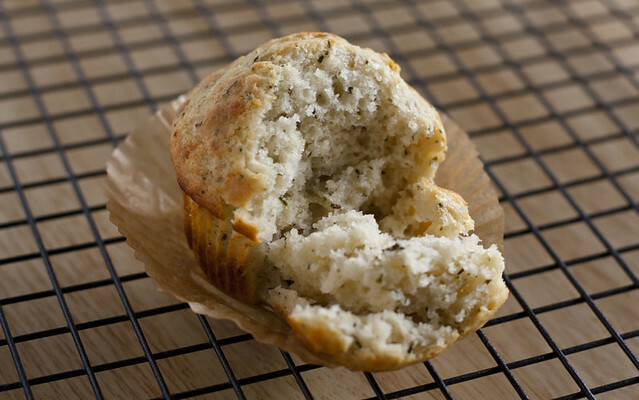 Whisk together the flour, Parmesan, sugar, thyme, rosemary, basil, salt, baking soda, and baking powder. In another bowl whisk together the buttermilk, oil, and egg. Pour the liquid mixture into the dry mixture. Mix together until gloppy and all ingredients have just come together. 3. Spoon into baking cups and bake for 20-22 minutes. Cool in pan on a wire rack for a minute or two. Serve immediately. Great story. I was amused, enjoying and smirking along with you. And then, at the last, the Zelda quote put me over the edge & I laughed out loud. I especially love the tantalizing pictures interspersing the text. Thanks again for making my day! I love to read you Black Friday shopping venture. Nice as usual. I too prefer to shop from Amazon. 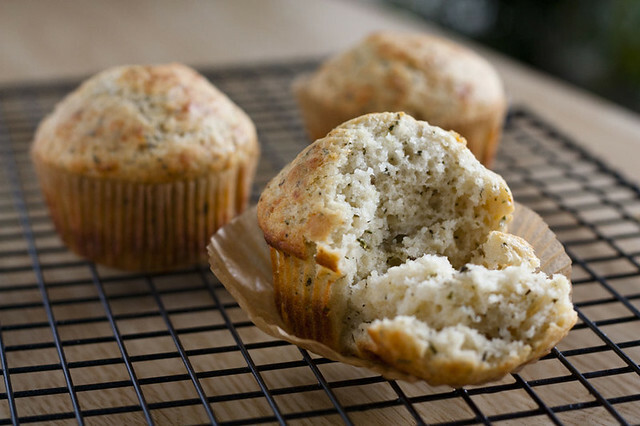 Parmesan herb muffins looks delicious. 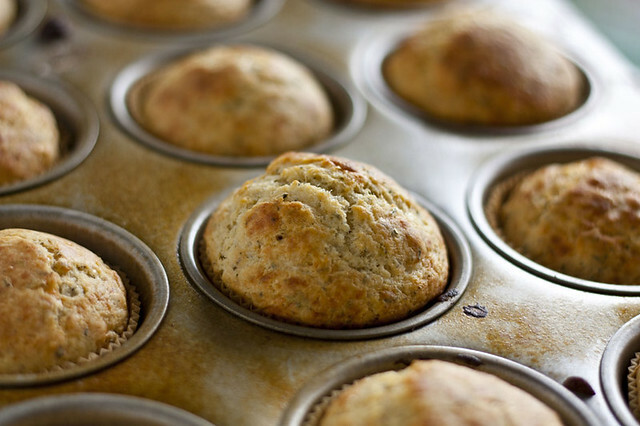 Love the sound of these muffins. Bookmarked! I can't believe you A) found Hermes scarves for $100 and B) got into a snit with a bitchy old lady. You are far stronger than me, sir. "If these people were crazy enough to camp in front of a Best Buy all night, then it was doubtful they would have any compunctions about shiving you in the kidney for the last flat-screen television at %75 off the sticker price." SO funny. I, too, ventured out into the shopping world on Black Friday. I headed to the stores around 3:00 AM. My mistake? I forgot to eat! These muffins would've saved me from the 7:00 AM crash that followed the chaotic Target spree. Well, lesson learned and trust me Garrett, it won't happen again. Any other quick breakfast ideas for me? LaWanda: At Denny's it is, "Ham and scrambled egg sandwich with Swiss and American cheeses on grilled sourdough. Served with choice of hash browns or grits." Loved Denny's in High School. Now... not so much. These look amazing. I appreciated your Zelda quote and Black Friday humor. I also spent the day on Amazon making too many purchases in the privacy of my own home. I can't believe you went through all that ordeal! Thank goodness these lovely muffins provided sustenance! They look delicious! I made these yesterday for my study group's pre-finals marathon cram. They were so flavorful and comforting; perfect for the cold weather. They were also very filling but without being "heavy." I will definitely bake these again. this looks scrumptious. i'm going to bake these to take as a on-the-road snack to a wine tasting :) will it work with 1/2 parmesan and 1/2 pecorino, and milk instead of buttermilk?